The solar energy is a renewable power produced by the sun, a star around which the earth moves. The sun is the gravitational centre and the only thermal energy source of our solar system. This form of energy can be converted into both thermal and electrical power. If this enormous quantity of energy was adequately exploited, it could guarantee economic savings as well as less pollution. It is, in fact, an ideal clean and renewable power source, since it has a limited environmental impact, compared to fossil fuel such as petroleum and coal. The thermal energy, which is absorbed from the sun’s rays by a solar collector, can be used to meet various energetic needs, such us the production of both hot water – for heating as well as sanitary use – and electric as well as mechanic power. The main difference between the thermal and photovoltaic energy is that the first uses the solar power produced by a solar collector to heat fluid circulation, while the second produces electric power. The energy derived from the sun is 15 000 times bigger than the energy currently in use. But there are some problems: the not constant sun’s rays of lights and the law concentration for surface unit make the power stations very expensive. But in a near future, research investments could improve this form of energy production with tangible benefits to the community. 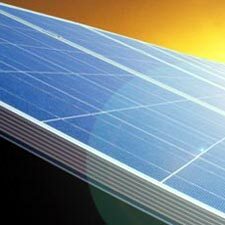 Nowadays most of the studies aim to the production of more efficient and less expensive photovoltaic cells. More ambitious studies aim to the building of orbiting solar stations, which should be constituted of photovoltaic cells that convert the light of the sun into electric power to be conveyed, afterwards, through an antenna, on earth. These solar stations should have strong rays influx not interrupted from atmospheric or seasonal agents. To make the research on this type of applications slower are the high prices of them and the few funds addressed to this purpose. According to the current projects, these solar stations will be installed not in the near future, and surely not before the year 2040. The biggest photovoltaic Italian station is near Salerno; it has been working from 1995. Another one, always from ENEL, will be launched in 2008 in Montalto di Castro (Vt): ten hectares of solar panels. In Brindisi, the biggest European photovoltaic park will be probably built on the ex-petrochemical pole area. It should be finished by the year 2010 and it is supported by University of Puglia.